The key to doing these effectively is to think about the right questions and clearly articulate answers for your project. This exercise sets you on the right path to defining the project and will enable you to facilitate or lead fruitful discussions with your colleagues and stakeholders. You will be left a clear definition of what the project is supposed to achieve – and something that all can agree to. There is no real limit on how many, or how few, of these short vision statements you need to produce, but in general follow the mantra that “less is better." Try to be as concise and clear as possible and strive to focus people. In the Objectives section, develop a list of the key objectives of the project. Create statements that describe in more detail what it is that the project is going to achieve. You may want to separate your objectives by type – for example business objectives as distinguished from technology objectives. To allow customers to initiate requests for customer service 24×7 via phone, email, or application, gain immediate access to a human being, and be able to track their complaints online from initiation through resolution. To reduce average case resolution time to 1 hour, and to no more than 24 hours for 99% of cases. To achieve an “Excellent" rating by customers on at least 80% of customer service cases. The key with the objectives is to make them Specific, Measurable, Achievable, Realistic and Time-bound (SMART), so make sure all of your objectives pass this test. What business processes will be added, changed, or removed? What departments, business segments, or locations will be affected? What organizational assets will be altered? What applications will be installed, modified, or replaced? What technology infrastructure will be implemented, altered, or decommissioned? Clarify scope in each of these areas by also stating what areas are not affected. Customer interface – Build an interface where customers can view their tickets. Enable them to drill down into the history for each interaction on a ticket, and to respond or comment online to an interaction. Report interface – Develop a report interface where agents can review resolution time across all tickets, and drill down to the detail on trouble cases. Agent interface – Enable automatic, instantaneous assignment of cases to available agents, with capability to respond to customers via commenting in the case, instant messaging, or phone and update case status. 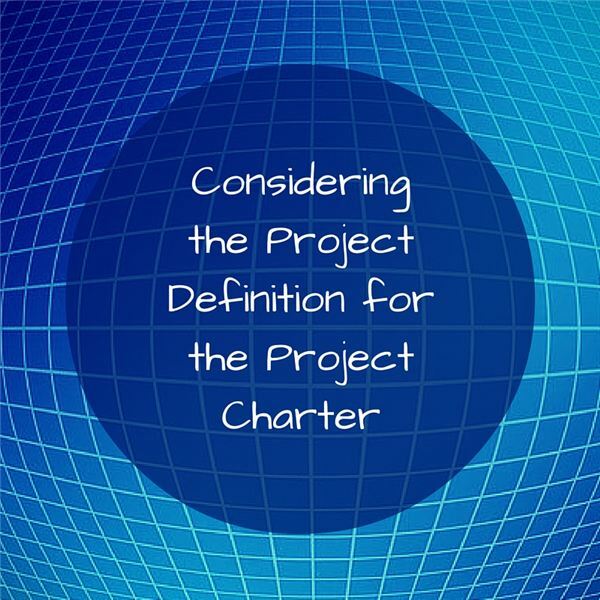 Once you have completed the Project Definition section of the Project Charter by completing the exercise outlined in this post, you will be ready to complete the charter by working on the project organization, project plan, and other key project considerations. The Project Charter is a foundational document for managing your project, and on small projects you can add tremendous value and even astound and impress your colleagues with a high impact Project Charter alone.